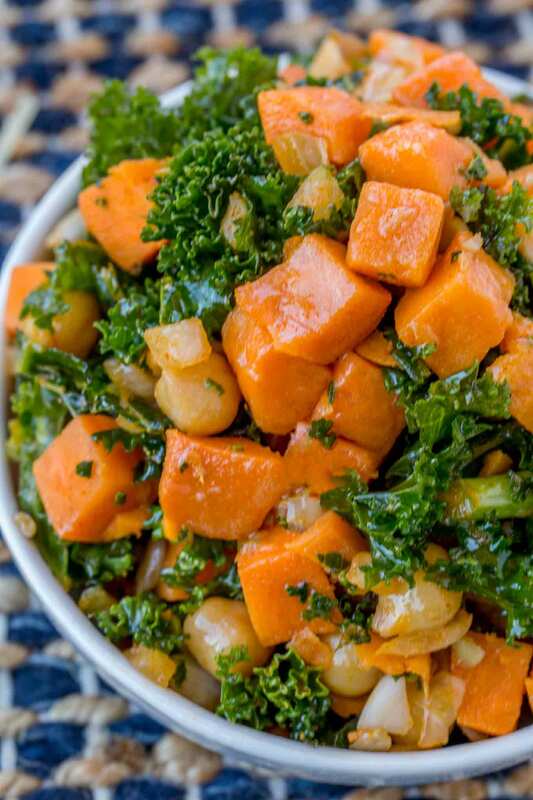 Chickpea Sweet Potato Kale Salad made with a delicious olive oil and lemon vinaigrette is a high protein super healthy lunch option. 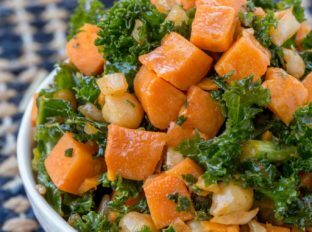 Roasted sweet potatoes are a super flavorful addition to this salad and even with the 2 tablespoons of olive oil in the recipe each serving doesn’t make it too heavy. I like to serve this as a bed of ingredients and top it with freshly grilled chicken breast strips and grape tomatoes. Bonus points if you roast the tomatoes in the oven with the sweet potatoes. We love making salads with kale, in fact on of my favorite restaurant dishes on a recent weekend away in Carmel, CA was a delicious kale caesar salad with homemade croutons and smoked Parmesan. It even gave my husband an appreciation for kale salads. I find people who aren’t fans of kale in salads tend to not prepare the kale appropriately. For me, learning to build in marinating time (I tend to do this instead of massaging) has made eating kale a much more enjoyable food. Looking for more salad recipes? 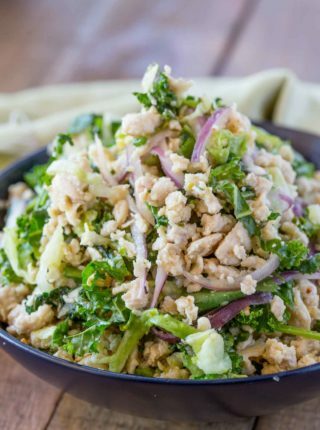 Try Cashew Kale Salad, Rainbow Thai Chicken Peanut Salad, Mango Curry Chicken Salad or Pico de Gallo Salad. Massage the Kale! This makes the kale significantly more pleasant to eat by breaking down some of the fibers in the kale. If you can make the salad and dress it more than 20 minutes before eating the flavors will be more cohesive too. Want to add more ingredients? Add tofu, skinless chicken breast or skinless turkey breast – ingredients that are now FREE thanks to the new Freestyle program! I also sometimes roast grape tomatoes or shallots with the sweet potatoes and onions. Tear the greens into smaller pieces and knead the leaves like you would a bread dough. Just as you would cream butter sugar together long enough to see a dramatic lightened mixture as you knead the kale leaves you will see the green colors become much more vibrant and noticeably softer. Why do you massage Kale? Kale is a very bitter and fibrous green leafy vegetable. If dressed without massaging it would be unpleasant to eat and the taste would be quite overwhelming. Massaging kale allows some of the fibrous texture to break down and as the kale softens the flavors become more agreeable. Can I skip massaging the kale? If you prefer not to massage your kale, toss it in vinaigrette and let it sit overnight in the refrigerator to allow it to soften naturally over time. Kale Stripping Tool: I love this tool because it makes a chore easier AND I can make my kids do it without the use of a knife. We live by this tool for kale. Lemon Juicer: Love this for juicing citrus, it gets all the juice out and easily! 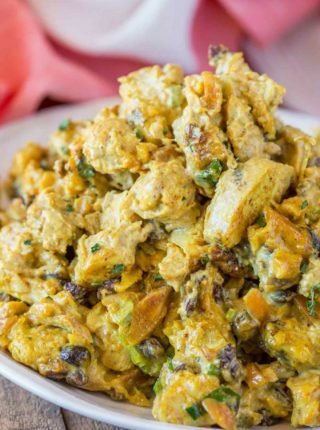 Toss the sweet potatoes, onions, salt, pepper, and half the oil in a large bowl. Roast on a sheet pan for 20-25 minutes. Let cool while making the rest of the salad. In a small bowl mix the rest of the olive oil, lemon juice, dijon mustard, paprika and sugar. 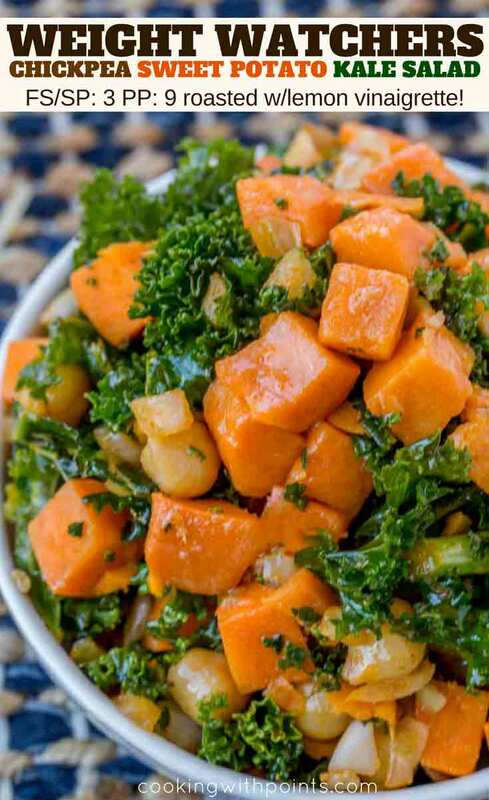 In a large bowl add the chickpeas, kale, sweet potato mixture and dressing and toss together. Three of my favorite ingredients in one dish! I love that you kept the the dressing simple and delicious! Thanks, Dorothy! I like to keep recipes simple and easy. How did I not know about massaging kale?!? This looks so good! 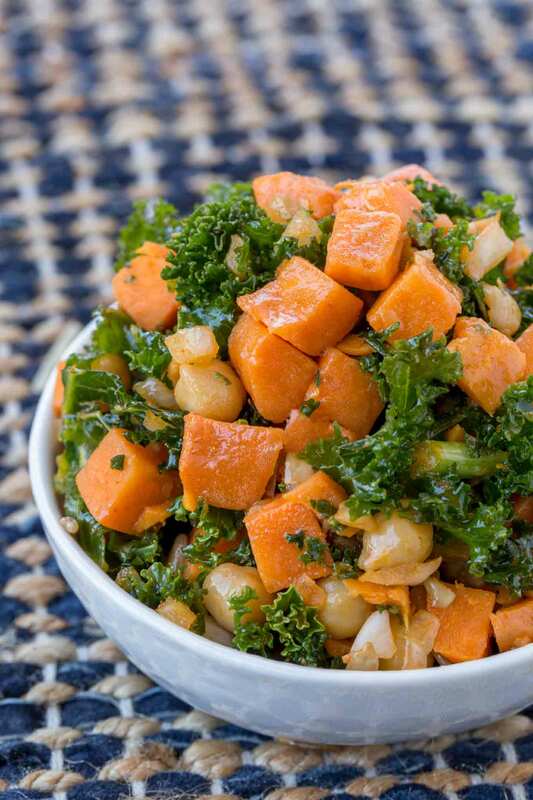 Sweet potatoes and kale sounds like an amazing combination of flavors! This is my kind of salad!!! Perfect for lunch!! Loving this salad and all its flavors! 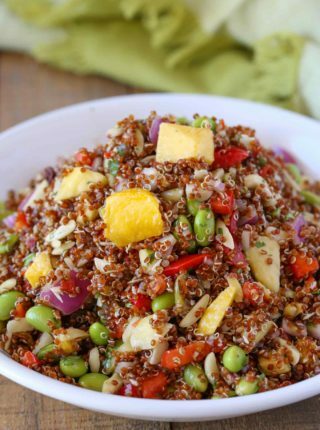 This salad looks like the perfect lunch! I have recently fallen in love with kale. I bet this salad would be amazing! 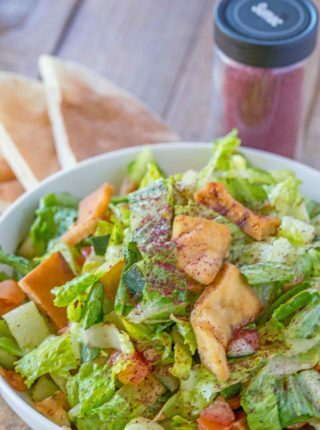 So hungry for this salad! I will make this soon! Is this a vegetarian dish?